Set across over 1,000 hectares of lush green landscape, Jumeirah Golf Estates, is an unrivalled residential and leisure destination, offering attractive investment opportunities and world-class amenities. Combining a neighbourhood environment with world-class facilities, Jumeirah Golf Estates currently comprises of 16 unique communities, which overlook two of the world’s finest golf courses, Earth and Fire. Dubai is the among the world's fastest growing holiday destinations, thanks to the ultimate luxury hotels, fine dining, tax-free shopping, and the fantastic climate. Add a fantastic collection of world class golf courses including the Fire Course at the Jumeirah Golf Estates and you have the recipe for a perfect golfing getaway. Opened for play in 2010, the Fire Course at the Jumeirah Golf Estates was, like its well known sibling and host of the Dubai World Championships, the Earth Course, designed by former world number one, Greg Norman. The course measures a staggering total of 7,480 yards which will be more than enough to challenge even the very longest of hitters however additional sets of tees also allow golfers of all abilities to sample this magnificent course. Throughout the Fire Course, tees have been carefully placed to provide variety of length, direction and elevation, while the landscape's natural features and topography are employed to provide even more challenging round. Surrounded by the Arabian Desert, the Fire Course has distinct links type attributes such as generous, undulating fairways flanked by tall, choppy rough and sloping greens which are well protected by large, well placed bunkers. This is a real thinking man’s golf course. Simply shooting straight for the pins will not always be the best strategy. Despite its modern setting, the Fire Course can be viewed as a bit of a throwback to more traditional courses. 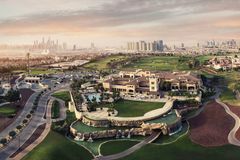 With the Earth Course next door and two further courses – the Water and Wind designed by – on the way, the Jumeirah Golf Estates are set to become one of the finest golf holiday destinations anywhere in the world. We were advised that buggies were not allowed on the Fire Course due to course maintenance and accordingly we would be provided with trolleys instead. However on presenting ourselves at the reception we were advised that we could play the Earth Course with buggies. This was the best course we played in Dubai, a joy to play round. just too many bunkers! not sure about how many the total is but it must be well over 100! 5 or 6 on every hole. we had an issue with the buggy. distance device in the cart froze on 1st. We swapped on the 9 th and the distance device froze again but more annoyingly forward gear stopped working and we had to reverse down several holes including some narrow wooden pathways over marsh and water. the club could not have been nicer when we got in. We had 4 analogies from various members of the management team. and a complimentary round of drinks and offer of lunch. (which we declined). My husband and sons really enjoyed playing this course and highly rated the practice facilities. We went back and used the practice range and pool facilities on our last day. Golf pro shop v good - made several purchases.